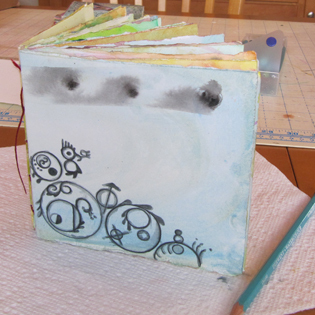 Here's another project from my retreat with Lora Hart & Lorena Angulo: making personal journals. 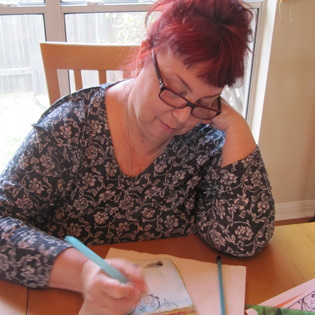 I've blogged the journal-making process multiple times before. 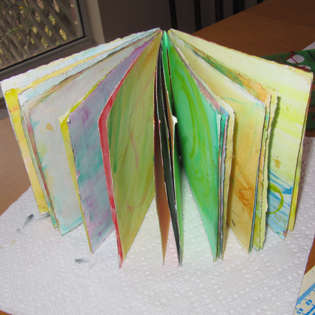 We ripped paper into pages and then slapped some paint on them. That was interesting, as I usually paint mine after assembly, so it was impossible to control colors on adjacent pages, but easier to paint. Then we stitched them together with a needle and thread. 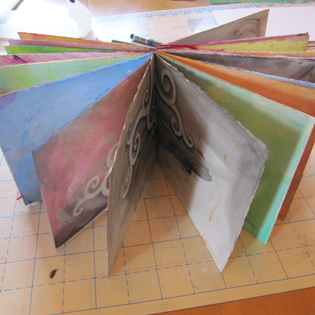 The image above is my finished journal, with background work started on several pages. 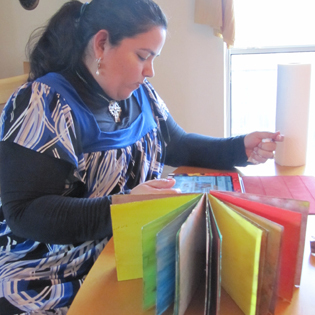 Here's Lorena perusing the net after completing her vividly colored journal. And Lora bravely started doodling right on the front cover of her journal, of which I seemed to get more images.